"Never leave photos lying around." Florence Carala (Jeanne Moreau) and her lover, Julien Tavernier (Maurice Ronet), speak longingly over the telephone. Both seem as though they'd be lost without the other one, but Florence cannot leave her wealthy, war-profiteering husband (Jean Wall), who just so happens to be Julien's boss. At some point during their conversation, which is drowned out by Miles Davis' sizzling score, the two decide that Julien must kill Florence's husband. The skilled veteran of France's war in Indochina sneaks out of his office, sets up an airtight alibi, and successfully murders the husband while making it look like a suicide. Everything is going well for the couple until Julien realizes he left some incriminating evidence at the scene and must go back to retrieve it. Thus begins Louis Malle's first narrative feature, Elevator to the Gallows (Ascenseur pour l'�chafaud), which is equal parts Alfred Hitchcock and Robert Bresson. With unparalleled technical precision, Malle sets up the plot beautifully for what is a magnificent thriller�the kind of movie where audiences won't have any clue how things will turn out, but by God it's fun to wait and see. Running back into his office building, Julien leaves his car running in the street. Flower girl V�ronique and her boyfriend, Louis (Georges Poujouly), steal the car and go joyriding. Meanwhile, Julien becomes trapped in the elevator after the security guard shuts off the building's power for the weekend. It only gets worse for him when Florence sees the two kids driving the car and assumes Julien is taking off with another girl. The rest of the movie, which was originally titled Panic for its US release back in 1958, follows the storylines of the kids, Julien, and Florence over this fateful weekend that will see unexpected crime, belated justice, and turmoil for all. Florence wanders the streets looking for Julien, with Moreau strutting that sensual walk of hers that later became indispensable to the nouvelle vague. V�ronique and Louis are the chic youth that would later be common in the works of Godard, Chabrol, and Truffaut. The screenplay, by Malle and Roger Nimier from a novel by No�l Calef, weaves between the various plotlines with audacious jump cuts from editor L�onide Azar. The film brims with unpredictability, especially in scenes showing Julien desperately seeking to escape the elevator while suspended in the shaft. In many ways, Malle's B-movie thriller marks the unofficial arrival of the New Wave. With cinematographer Henri Deca�, Malle creates a vivid portrait of Paris on the eve of the Fourth Republic's collapse. There's a subtle political overtone to the story, with Louis and Julien both being disillusioned about French colonialism that seems to suggest the proceedings in this thriller aren't merely visceral delights. This isn't a Paris I ever remember seeing in any other movie. It's simultaneously romantic and seedy; modern and archaic. Deca�'s cinematography aids Malle immeasurably in establishing tone. Using natural lighting, he shoots the actors as if they're normal people, not stars. Moreau's asymmetrical face looks gorgeous in the stark, grainy black-and-white images. Like the dialogue, the cinematography seems to be spontaneous and as surprised by the plot twists as the audience is. Each actor inhabits his or her part with gravitas. Moreau captures the emotional instability of Florence without becoming too theatrical, while Ronet is the quintessential assassin. He's harsh and calculating, coming across as totally amoral but somehow selling Julien's predicament. In a perverse way, I found myself wanting him to get out of that elevator and escape scot-free. The two kids are also quite good, with both Poujouly and Bertin conveying a na�vét� about the situation they find themselves in while confronted by German tourists who know they are impersonating Julien. The bit players are also memorable, appearing briefly but constructing lively personalities to flesh out the film's unique vision of France. 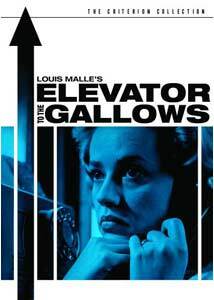 Truly, Louis Malle's Elevator to the Gallows is an astonishing accomplishment. Each scene is directed with flair and passion, which makes the fact that he never revisited the thriller genre a great loss for cinephiles. Only 25 at the time, Malle comes across as a skilled veteran. The revolutionary decision to have Miles Davis score the film with improvised jazz pays off splendidly, creating a brilliant counterpoint to the visual images. There's a genuine depth to these characters, as we watch them struggle through the weekend and wait to see how things will end for them. Isn't that the most thrilling thing of all? Image Transfer Review: The 1.66:1 anamorphic widescreen transfer is a revelation. While yes, the picture is somewhat soft and grainy, this is an accurate reflection of the source material and truly brings the theatrical experience into your home. Contrast is quite good and detail is impressive. The overall picture has a tremendous sense of depth and filmlike look. Audio Transfer Review: The original French mono audio is preserved on this DVD, coming across quite nicely and cleanly. There's a trace of hiss that I picked up on at times, but it's barely noticeable. Otherwise, everything sounds crisp. Insert—collectible booklet contains an essay about the film, as well as an excerpt from a Louis Malle interview with Philip French. Interviews—multiple video interviews with Louis Malle, Jeanne Moreau, and Maurice Ronet. The Miles Davis Score—a collection of interviews and featurettes about the film's revolutionary score by Miles Davis. Crazeologie—Louis Malle's absurdist student film. Extras Review: The Criterion Collection's supplemental material begins with an insert that features DVD specs, as well as some worthwhile reading material. Louis Malle on the Ground Floor by film critic Terrence Rafferty is a smart essay that gives a nice sense of the movie within the director's filmography and the cinematic climate of France at the time. Also included is an excerpt from an interview Malle did with Philip French in 1993. Malle on Malle: Elevator to the Gallows provides the transcript of that interview, focusing solely on the part where the two men discuss the movie. There's talk about Davis' score and Malle's early career leading up to this point, so it also gives a nice sense of context. This two-disc set primarily houses the extras on the second disc, but the original theatrical trailer and the 2005 re-release trailer can be viewed on Disc 1. Presented in anamorphic 1.66:1 widescreen, both feature optional English subtitles and the original trailer provides a glimpse of Malle and company accepting awards for the film. Over on Disc 2, things begin with Louis Malle, 1975 (17m:05s). This Canadian TV interview, from the set of his Black Moon, repeats some of the information mentioned in the insert. Malle's quite lively, though, and gives a nice sense of working with Cousteau on The Silent World. Following this is Jeanne Moreau, 2005 (17m:59s). Here, the actress explains how she came to the project and its effect on her career, as well as providing information about her ideas on acting and impressions of Malle. This is an excellent, informative interview. Continuing with interviews, Malle and Moreau at Cannes (10m:39s) is from 1993 and shows the two talking about the film and their careers with Michel Field. Malle dominates the talk, but they touch upon some themes regarding film criticism and the New Wave that aren't covered elsewhere on this set. Next is Maurice Ronet (04m:37s), which is a TV interview made right before the movie's release. The highlight of the special features is The Miles Davis Score. This multi-part segment covers just about everything you can think of concerning the evening of December 4, 1957 when Davis recorded the music. The Recording Session (05m:51s) shows clips of Davis playing to the images of the movie and concludes with an interview by Malle for French TV. It's great to catch a glimpse of that remarkable evening that began a new chapter in Davis' career. On Piano, Ren� Urtreger (14m:41s) is an interview with Davis' pianist. Urtreger dishes out a ton of information about jazz and everything surrounding his relationship with Davis, providing for a highly informative and insider look at the man and music. Rounding things out is Miles Goes Modal: The Breakthrough Score for Elevator to the Gallows (24m:59s). Jazz trumpeter John Faddis and historian Gary Giddins envelope the viewer with information about Davis, jazz, the score, and French pop culture of the late 1950s. This is an intelligent, thoughtful discussion about music and culture. Wrapping things up is Crazeologie (06m:16s), a 1954 student film by Malle, an absurdist short inspired by Samuel Beckett, Eug�ne Ionesco, and Charlie Parker. It's an odd film, but fascinating. Louis Malle's Elevator to the Gallows (Ascenseur pour l'�chafaud) is an exquisite thriller that offers more than mere suspense, but a compelling cast of characters and the beginning of cinema's most important movement�the French New Wave. The Criterion Collection presents it with a breathtaking transfer and excellent supplementals.